The Bates Dance Company in November 2012. Photograph by Phyllis Graber Jensen/Bates College. 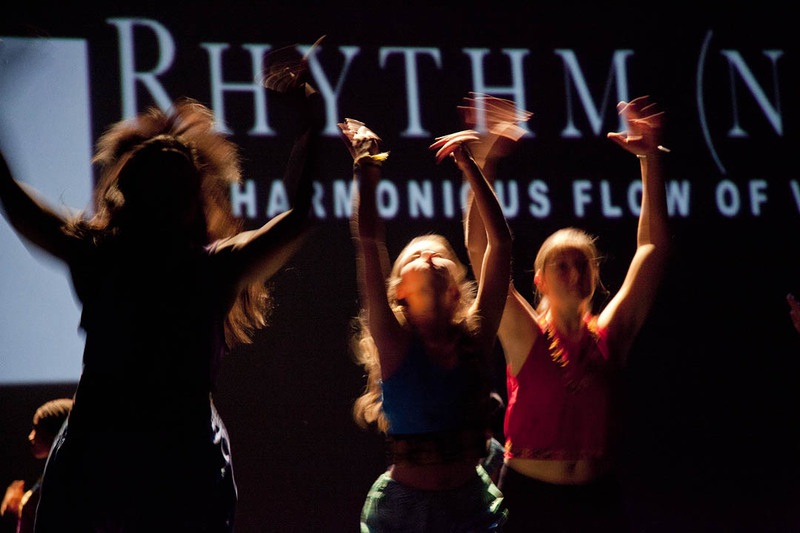 Featuring aerial performances, works exploiting the capabilities of video, and a total of some 70 student participants, the Bates College Dance Company offers After Affects, its annual spring concert series, in performances in Schaeffer Theatre, 305 College St. Performances take place at 7:30 p.m. Friday, March 29; at 5 p.m. Saturday, March 30; at 2 p.m. Sunday, March 31; and at 7:30 p.m. Monday, April 1. The company presents two different programs over the four nights. Program A will be performed Friday and Sunday and Program B on Saturday and Monday. Admission is $6 for the general public and $3 for seniors and students, and one ticket is good for attendance at all performances. Tickets are available at batestickets.com. For more information, please call 207-786-6161. The programs comprise a mix of jazz, hip hop and modern dance created by students in composition and advanced composition courses. Three students in an independent study program perform with aerial straps, hoops and silks. Dance major Kirsten Pianka will offer a senior thesis. Travis Jones ’13 at work last summer as an instructor at the Trapeze School New York. Photograph by Phyllis Graber Jensen/Bates College. Travis Jones, a senior who performs on straps of thin fabric that wrap around the arms and function something like gymnastic rings; Alison Haymes, a first-year student who works with a metal hoop; and Kelsey Schober, a first-year student who performs on silks — long, broad colorful fabrics that hang from the fly space. Two sophomores will present works involving video. Talia Mason’s “Empty House” uses a video projection to create an environment for three dancers to perform in. The work is one of two in the program to feature an original score by junior Conor Smith, a music composition student. Working with videographer Joshua Ajamu, a junior, Tomisha Edwards created a dance for the camera that will be shown on screen. “Video is an important aspect of contemporary dance composition, and I’m proud that we are teaching our students these skills,” says Boggia, herself a video dance artist. The weekend following After Affects also features a Bates dance offering. Dance major Zoë Fahy will perform a site-specific dance thesis, “359°,” at the Bates Mill Complex above Museum L-A, 35 Canal St. Fahy performs the 20-minute piece at 7:30 and 8 p.m., with a short intermission for Q&A, on Friday and Saturday, April 5 and 6. A student shuttle to the mill leaves from the steps of Chase Hall, 56 Campus Ave., at 7 p.m. Admission is free, but tickets are required: batestickets.com. FMI 207-786-6161.